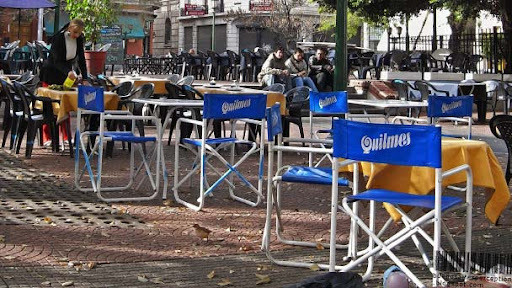 The extinct native Indian tribe "Quilmes" (Kilmes) has given its name to a city in the Province of Buenos Aires, a village, and a beer brand in Argentina. Nowadays, when people speak of Quilmes they mostly mean the brew. It is the leading brand when it comes to beer in Argentina. Furthermore, Quilmes is sort of a national Argentine symbol and was one of the country's biggest assets. During the last economic crisis in 2001/2002 the brewery got into turmoil and, thus, had to be turned over to foreign investor-owned corporations. Since then the Brazilian company AmBev has gradually acquired the majority of shares. It looks like cooler temperatures are keeping people from drinking beer outside - I guess they're mostly inside! Cheers! Quiet time but I'll bet it gets busy before long. I like the word, for sure. Would be fun to find some in our nearby import liquor store! I am anxious to see if they have it. One thing for sure, the name is easy to remember. How many other beers start with the letter Q? Glad you posted on the ABC around the world! Wonder how the tribe feels about their name being appropriated for commerce. In any case, a unique Q. Nice, decent beer. Best to quench the thirst :) I've been told by many Argentines that is the name of a tribe so people didn't forget that. Brenda: In California they sell Quilmes at Trader Joe's, you can try looking for it there, if you have a TJ close to you. Quilmes sounds a lot more exotic than AmBev. I think I shall have to try Quilmes if I can find it here. An excellent choice for Q. Thanks for visiting mine, and on behalf of the ABC Team, thanks for your post. It will always be "The Argentinean beer". Great taste. Hmmm. I don't always like it when foreign buyers take over a company. Something gets lost, usually. I hope this beer company maintains the same quality. well, this is good ,it encourages friends to have another kind of atmosphere.